I decided to update the look of the city guards a bit. Added some leather and metal studs. I'll be taking this sketch and doing a full colour illustration with it, but wanted to post this here for reference. Very nice Springheel. I quite like it. 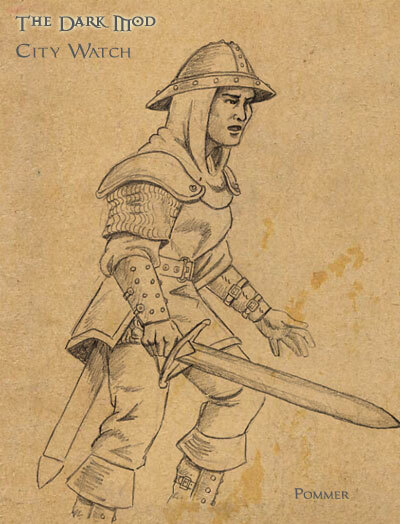 I think you should make the coif, arms and legs chainmail though, and the hat is a little broad there, he almost looks oriental. These guys obviously wouldn't be BJable, what with that big helm. It's the same helmet as this picture...maybe slightly larger, but not intentionally so. I think it's perfect, it's exactly what i would expect to find in the city. I had alrady something inspired by the City Guard helmets modeled up for nightblade guards. It has a bit more shape to it I think, but I could add the rivets and abit of detail. 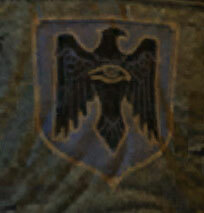 ... also I'm not sure we should so blatantly copy the 'spread eagle' city watch insignia frm T3. Edited by oDDity, 15 December 2004 - 03:39 PM. But great texturing BTW ! We would need a city insignia and the city watch should wear this. also I'm not sure we should so blatantly copy the 'spread eagle' city watch insignia frm T3. Well, other than the fact that it's a spread eagle, it doesn't look much like the T3 version. There are dozens of different cultures that used a similar insignia, so it's not like it's copyright or anything. Still, the guards in T1/2 had NO insignia, as far as I know, so if someone wants to come up with something better, be my guest. The helmet on your model above is very similar to the one I had in mind for professional guards, so maybe we can save it for that. well the guards not, but the banners also had a black spread eagle on them. Edited by BlackThief, 15 December 2004 - 03:56 PM. I quite like it it fits perfectly to Dave's city in the background !